The thing with fruit desserts? Having fruit left over because most of the recipes call for medium apples, but my supermarket does not know the difference between size, they are all big. I hate to throw food away. And trust me I been so tempted of late. I’m pretty over anything that has to do with apples. But, I cannot do it – yes, call me wimpy. So, here I was thinking, what to do with all of this left over apples, that I did not use in the future mother in law birthday cake a couple of weeks back. And as I was thinking there, I started to crave a cookie. Stay with me, there is a relationship in here. Which, is actually funny, because in French Canada, the term galette is usually applied to pastries best described as large cookies. I like to call the galette, the lazy person’s pie. I mean no rocket science here - make dough, roll dough, put stuff on top of dough, fold over, messy-like and bake. Final product? A big… ahh, yeah, COOKIE! Did I just hear France flinch? But, so still munching on my cookie, I decided it’s on! I whipped up a quick dough using the food processor and after about 2 hours of chilling time in the refrigerator, took it out and totally use to my advantage the fact that a galette is totally a rustic tart, so there’s no need to worry about creating picture-perfect edges or even thickness. The apples where already marinated in heavy cream, with sugar for the original cake, but I added a bit of cinnamon and nutmeg. I also wanted to step up the flavor and protect the crust from becoming soggy and usually, the most used additional filling is a Frangipane, which is made with almonds, eggs, sugar and once incorporate it transforms into a rich, sweet almond filling. But, I was too lazy to go the extra step. So, once more the Galletas Maria came to the rescued, why not use that to create the barrier needed and on the plus size it’s going to give it a bit of a crunch? So as you can see this was sort of a fly-by-the-seat of your pants Apple Galette. Inspired by a simple Maria biscuit. Start by making the dough. In a food processor, add the flour, salt and sugar and pulse into combine. Add the chill butter and pulse until the mixture resembles coarse cornmeal. Add about 2 tablespoon of the water and pulse, check to see if the dough comes together when you pinch it between your fingers, if not, then add another half a tablespoon of water and pulse again until it comes together. Remove from the food processor unto a flour surface and gather into a disk, wrap in plastic wrap and refrigerate for 2 hours. Peel, core and cut the apples into ¼ inch thick slices. Place in bowl and add the sugar, spices and then the cream. If you are not using the heavy cream, you can use a bit of lemon juice instead. Remove disk from the refrigerator and let it soften for 10 minutes. Unwrap it and on a lightly floured surface, roll it out into a 12-inch round. Place in a baking pan lined with either a silpat or parchment paper. To help visualized the center, I took a cake pan and place on the middle of my rolled dough and marked a circle by pressing the pan down a bit. Then sprinkle the crushed cookies inside the circle and starting at the center of the pastry, place the apples in concentric circles, leaving a 1-inch border free of fruit. Rotating the galette, fold the dough border over itself, crimping and pushing it up against the outer circle of fruit. 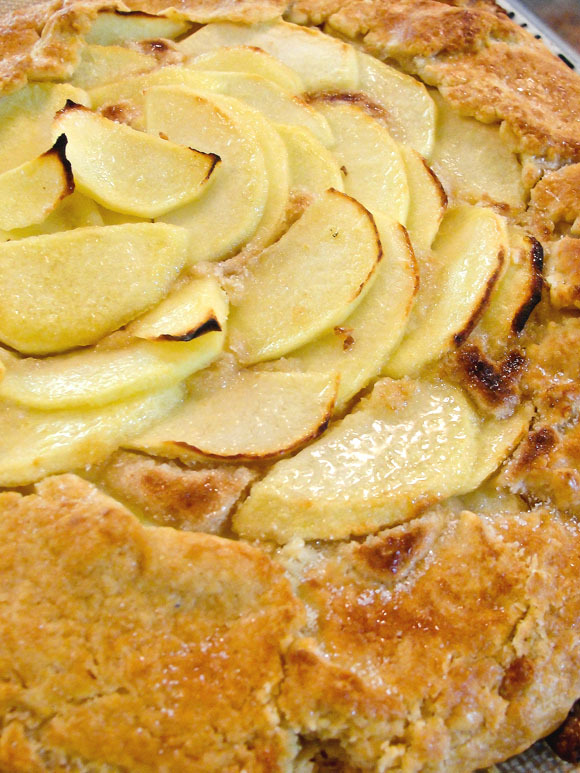 Bake for 40 to 45 minutes, or until the fruit is tender and the crust is golden brown. I read somewhere that once the galette is baked, serving it almost immediately is best, since the buttery flavor and aroma of the dough is most appealing when the galette is warm out of the oven. Tom can confirm this, since he loved it and pretty much finished it the next day for breakfast, by reheating it again in our little toaster oven. So there you go, a perfect, simple way to use left over apples, or pears, or any type of fruit for a quick satisfying dessert.